Journey times could double today | What Car? Journey times on major routes are likely to double today as the Christmas getaway begins in earnest, according to the AA. The AA has said it expects more than 18 million cars to take to the UK's roads over the coming days, with the peak expected from lunchtime today. A spokesman from the AA said: 'Today and tomorrow will be the two busiest days. However, because it's a normal working day, we are expecting Friday lunchtime and early afternoon to be very busy. However, the AA expect drivers' travel plans to run a lot more smoothly this year, with mild weather conditions expected this in stark contrast to the snow and sub-zero temperatures of last Christmas. 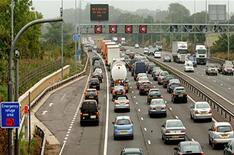 The heaviest holiday traffic is expected to hit routes including the M1 in Buckinghamshire and Bedfordshire, the M4 between London and Newbury, along with the usual hotspots on the M25, M4 and M5. The Highways Agency says that more than 500 miles of roadworks have been completed before the festive getaway, with a further 60 miles suspended over the holiday period. However, roadworks will remain in place at 26 locations, which include a 32-mile stretch of the M1 near Luton, Bedfordshire. Other works that will stay active include a 15-mile section of works on the M25 near St Albans, Hertfordshire, part of the M4 near Wokingham, Berkshire, and a 12-mile stretch of the M62 near Huddersfield in West Yorkshire. Traffic in all town centres and shopping centres will also be extremely busy, with many retail analysts predicting the busiest day on record with traffic further buoyed by the last-minute 'man-dash' for presents. Finally, there's some good news for drivers who'll be working over the Christmas period. The number of people taking the whole Christmas period as holiday is expected to exceed last year's figure of five million, so journey times on commuter routes should be a lot quicker.